Socapex are a type of electrical connectors, known in the entertainment industry primarily for 19-pin electrical connectors. The Socapex was first created by a company called Socapex in 1961, but the term is now often applied to similar off-brand connectors as a genericized trademark. 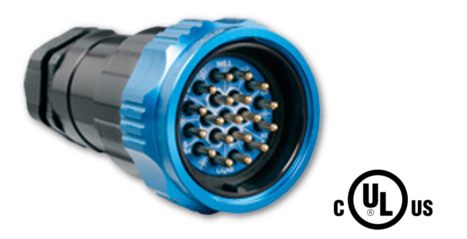 The circular connectors are used in film, television, and stage lighting to terminate the ends of a multi-cable. They are wired with six live pins, six neutral pins, six ground/earth pins, and a final central pin used to aid alignment of the male end of the connector with a female receptacle. The Connectors come in male and female form like other connectors. Some fixtures and assemblies containing several lamps, such as PARbars may use a panel mounted Socapex connector to avoid the need for a separate breakout, and many such fixtures also incorporate a female Socapex connector to allow further similar fixtures to be chained from the same supply. Socapex connectors may be found on circuits connected to dimmers, or may be inadvertently fed from three-phase circuits that exceed the connector voltage rating. Some audio equipment may use Socapex connectors which must not be connected to power circuits. A full range of accessories are available, including ground disks, crimp tools and break-out backshells. See the socapex Wiring and Cable Diagram Here.